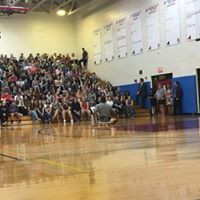 I had the pleasure of speaking at Cassadaga Valley middle/high school and Sinclairville Elementary School in Western New York on September 21st. The gym was filled with students from every grade and they all gave me their undivided attention, even the littlest group of kindergarteners. Each and every student seemed to genuinely enjoy listening to my story and learning about wheelchair basketball. There was one particular student that I spoke to after my speech who was going through a rough time in their life and they had expressed to me that my story had inspired them and gave them hope. I truly hope that my message has helped this student get through their rough time. I hope to work with these schools again in the future.